One of the best feelings in the world is that one single moment when you realize you are finally on vacation. You will experience this feeling over and over when you stay at Folly Villa. Start your day off with breakfast prepared by the house chef out on the veranda. Drink your coffee overlooking the beautifully landscaped yard while taking in the spectacular ocean views. This four bedroom, four bath home is not only large in size but it comes with an equally large and accommodating staff of five including a chef and head-of-house, chambermaid/waitress, laundress, and two gardeners. They will assist with your every need and ensure that you’re completely pampered during your stay at Folly villa. The large living area, which opens up on all four sides, is quite grand with tall, wooden rafter ceilings and is a great place to lounge and enjoy the breeze while staying out of the sun. There’s plenty of space for a large group to dine outdoors with a table set for ten on the patio and another table on the lawn that’s set for six. While outside, you can also enjoy the heated pool as you watch the palm trees sway in the breeze and soak up the terrific Caribbean view. The Tryall club is well known amongst travelers as a fantastic property and Folly Villa is sure to meet your expectations as you unwind and enjoy the island life. 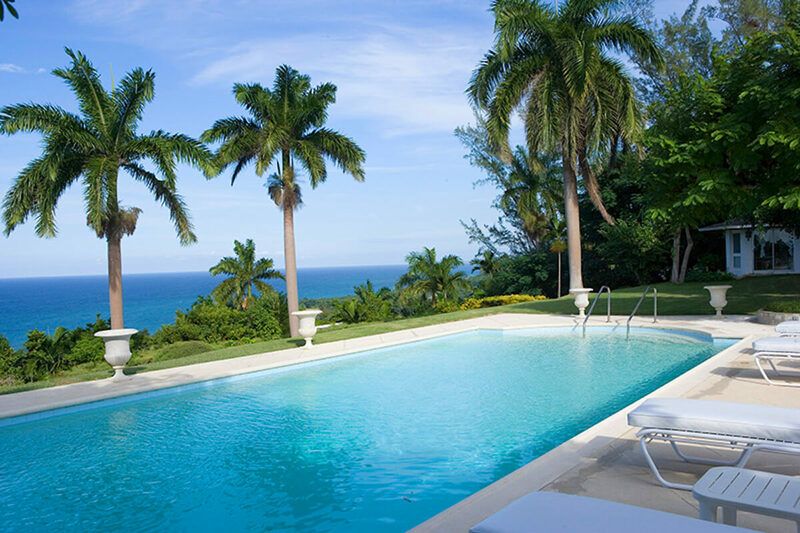 Villa Folly, a beautiful four bedroom home, sits on 3 acres of open lawns planted with specimen trees and commands a dramatic view of the Caribbean Sea with Montego Bay in the distance. Upon entering the Villa you are welcomed into a radiant garden courtyard. Covered walkways alongside sunlit inner gardens extend to the three Villa bedrooms, all with ocean views. bedrooms have king-size beds, however all four bedrooms can be pre-requested for either twin or king-size bed sleeping arrangements. Cottage and Villa master bedrooms, as well as the living-room, have cable television and internet service. All bedrooms have en suite bathrooms, ceiling fans and effective cross ventilation of ocean and landward breezes. For those who love a good read there is an ample selection of books, many brought by authors who have been our guests. Situated on Barnes Hill Road, Villa Folly is one of Tryall’s original homes and has been owned and nurtured by only two families. The Main House has the warm charm of a “Casita” as it is built on one level around flower-filled inner gardens, through which humming birds and yellow bananaquits come and go. One of the gardens has a small Moorish fountain, and there is a reflecting pool in the entry courtyard. All combine to create the relaxed intimacy of home and an indoor-outdoor freedom of spirit. It is easy to step from the living room, which is open on four sides, to swim in the heated pool or take in the exhilarating view over the golf course and the sea. Tennis courts and Great House amenities are within easy downhill walking proximity. The golf course and ocean beach are easily reached on foot, by golf cart or Tryall resort buses, but Villa Folly’s elevation, foliage, and ocean exposure ensure a sense of blissful seclusion that is often difficult to leave. Free shuttle service to nearby Tryall club locations, use of three four-seater golf cars and dedicated 24-hour staff.